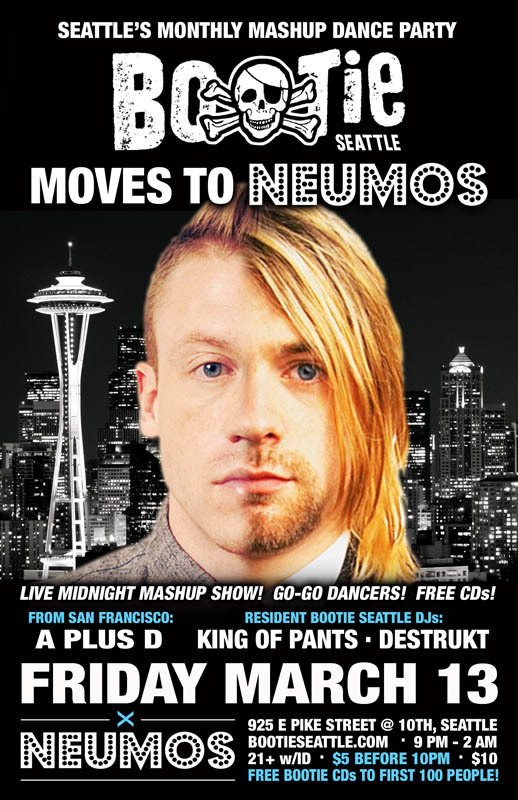 Seattle Bootie Moves To Neumos! Friday the 13th becomes a lucky day as Bootie Seattle returns in our brand new location – Neumos! Since 2005, Neumos has prided itself on its carefully-curated show bookings, excellent sound and lighting, and fantastic staff. The change in venue gives Bootie Seattle a chance to do more of what we do best, with a live Midnight Mashup Show, crazy go-go dancers filling the stage, and of course, spinning all the mashups we know you love! Coming up from San Francisco to help baptize our new home will be Bootie creators and DJs A Plus D, as they join Seattle resident DJs Freddy, King of Pants and Destrukt to spin the best mashups in the universe, keeping the energy going and party hopping late into the night. Come help Bootie Seattle usher in its new home, as we kick off the next generation of mashups – and mashup fans – in Seattle!